You would think since I usually don't have any issues with confrontation that I wouldn't have an issue with passive voice in my writing, but I absolutely do. After meeting with my critique partners last night this was the subject of my latest chapter - not aggressive when it needs to be. I think we as writers aren't always paying attention to what we are actually writing, just get the words on paper and move on. But the fact is, the voice needs to fit the scene. 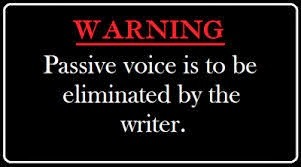 Passive voice is one of the creative writing skills that can make, or break, your readers continuing to turn the page. I mean, after all, isn't this what you're striving for? For the reader to keep turning the page? 1. It can be the difference between which word you choose in a sentence, such as "ing" or "was" words. Not that you can write an entire novel without words that end in "ing" or have "was", just recognize when you can avoid them. 2. It can be your description of an action scene. Are you adding too much internal thought in between dialog? This will slow down a scene really quick. 3. Long sentences are another way to stop the action. Make sure you are using short, clipped sentences when writing faster scenes. 4. Too much information. Info dumps can be one of the worst mistakes to use during an action scene. If it's information you need to convey to move the story along, find a different place to add it. 5. Using too many of the "same" word within a few paragraphs, even a name over and over. Watch for this issue. We all do it. 6. Emotion - this is the one that most recently got me. Your characters each have their own personalities, and sometimes they will be sad, or angry. You can't always stay in the same tone. Don't you get angry or frustrated? Well your characters do, too. 7. And finally, setting the scene. If it is an action set up, stick to the action, not the blue sky. In this type of a scene, changing the weather to fit the mood can help, such as a thunder storm. 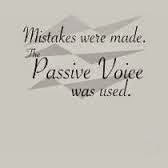 There's quite a bit to watch for to make sure your not writing in passive voice. I'm so thankful I have the wonderful critique partners that I do. Without them, I don't know what my books would read like! Again, reason number #423 why you need critique partners. I hope all of you have a nice weekend and enjoy the super bowl if you plan to watch. If I do it will be for the commercials!